I’m clearly not cut out for blogging – it’s been a LONG while since my last post, but I’m not sure anyone missed me. At any rate, I should begin with a disclaimer: Valrhona is a client of mine. Having said that, just because they are, doesn’t mean I’d necessarily write about them. Except this time, I genuinely think there is something that might be of particular interest to you. Conventionally, there are three types of chocolate: dark, milk and white. Without wanting to delve too much into the detail, dark chocolate is produced by adding fat and sugar to cocoa (a minimum of 35%), milk chocolate has added milk (in powder or liquid form), while white chocolate is a confection based on sugar, milk, and cocoa butter without the cocoa solids. And therein lies the problem for the pastry chef and amateur baker: the high milk and sugar content in white chocolate will cause it to burn easily, making tempering difficult, as well as using it to make cakes and desserts. 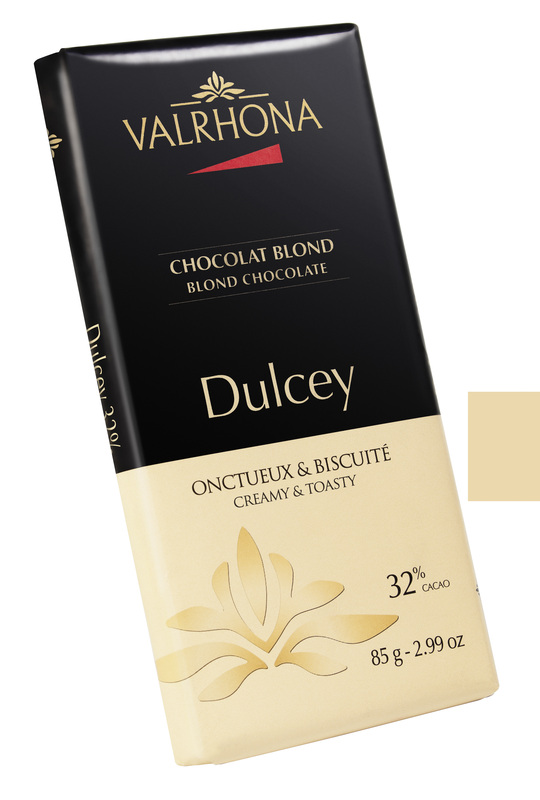 Valrhona has now come up with a solution: Dulcey. One early spring morning at Valrhona’s Ecole du Grand Chocolat, Master Chocolatier Frédéric Bau put some Ivoire chocolate in a bain marie as he prepared to demonstrate a recipe in front of pastry chefs from around the world. He used part of the chocolate for his recipe but, in a moment of absent-mindedness, completely forgot about the bain marie. Ten hours later the white chocolate had become blond, a colour he had never seen. The fragrance was extraordinary: it smelled of toasted Breton shortbread, caramelized milk and unrefined sugar and had a fresh-out-of-the-oven scent that was simply irresistible. He tasted it. To his pleasant surprise it was a pure delight, a treat that instantly took him back to his childhood, filled with happy memories. He closed his eyes and ecstatically savored that which had no name – he had just accidentally invented something new. Fast forward eight years, and after a huge amount of trial and error, Dulcey is now being brought to market. So why the excitement? This new chocolate not only tastes great, but from a creative point of view, you can use it do pretty much everything you would have wanted to do with white chocolate (bar coating), but with no danger of burning or getting a clumpy mess.